Evergreens need good drainage, so don't plant in a soggy spot. Phone ONE CALL (811) one week or two ahead of planting to have underground utility lines in the area marked. Also ensure your tree won't be located in a right-of-way or easement (check your survey plot plan), where it could be cut down later without your consent. Use a large enough marker to see from a distance and mark the spot, then look at it from different angles to make sure you like the location. Envision what the tree will look like growing there in 20 to 30 years. Using a spade or shovel, cut a circle in the sod twice as wide as the top of the root ball. This width will allow for easier lawn mowing plus eliminate any competition from grass. Lawn grasses compete with trees more than you realize. If you have another spot in your lawn that needs some grass fill-in, remove the sod in easy to handle pieces with some soil left on the bottom. Otherwise, just strip off the grass (with all its roots that could grow again) and place it in a pile by itself for later composting. Make sure the digging edge on your shovel is sharp (watch video here). Use a grinder or file to sharpen the shovel if it has a blunt digging edge. It's much easier to dig with a sharp shovel -- most shovels are dull when you buy them. A heavy tarp next to the planting hole provides a place to pile the soil. It will also make final cleanup much easier and neater. The best way to dig a hole is by starting at the center and working outward in small "bites." As you're digging, separate the soil into two piles: Good soil to be used for planting in one pile, and bad soil and rocks in a second pile, for later disposal. Dig the hole slightly shallower than the height of the root ball -- it's better to have the top of the ball higher than the surrounding soil, than it is to plant the tree too deep. Place the tree lifting it by the root ball -- don't yank on the tree trunk since this could damage roots. Ensure the tree is at the proper depth, with the top of the root ball slightly above the surrounding soil. Try to get the tree to stand-up straight on its own right from the start. Lightly pack some soil evenly around the base of the root ball, then check for straightness (plumb) from two sides. It's important to remove all the rope and twine tied around the tree trunk, since this can lead to girdling (choking) as the tree trunk and roots expand in future years. Use bolt cutters to remove at least the top half of the wire tree basket. While removal of the entire basket might be ideal, it usually isn't practical, since complete removal may cause the root ball to fall apart. Regular brown burlap will usually rot away, but it's still desirable to uncover at least the top of the root ball for good water infiltration. Synthetic burlap ("Leno") and treated green burlap should be removed from as much of the ball as possible without damaging the integrity of the root ball. Watch for extremely sharp "pinning nails" used by nurseries to hold the burlap in place! Backfill the planting hole 1/3 of the way and lightly compact the soil, ensuring the tree is still straight. Backfill the hole another 1/3 and lightly compact the soil again. Flood the planting hole with water at this point, and allow standing water to drain before you finish backfilling the hole with soil. Apply a couple inches of mulch to finish the planting job. Generally speaking, trees under 6 feet tall don't usually need to be staked, unless they were loose in the root ball or are planted in extremely windy locations. If you decide to stake a tree, check the guy wires occasionally to ensure the tree trunk isn't being girdled by the supports. All stakes and guy wires should be completely removed after one year. 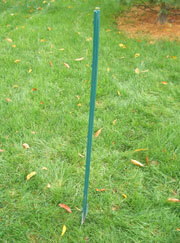 See various methods of staking trees on the tree planting page.